Experience a KM - hand crafted and state-of-the-art. This 22" tall Khalil Mamoon hookah features a silver striped glass base that is known to be the staple with this Egyptian hookah brand. The metal, silver stem is durable yet stylish and allows for ease of portability and set-up. The included KM-designed, wooden-tipped hookah hose is approximately 5 feet in length. The hookah's wide-gauge tubing locks out incoming air, and pulls clouds of smoke on every draw. The industry standard clay bowl and metal ash tray are also included. As a bonus, this hookah includes a base protector that can be used to wrap around the glass for protection during transport or use. These hookahs are individually hand-made and are not mass produced. Its design offers unparalleled smoking quality with awe-inspiring beauty. That is enough to guarantee it will turn heads at a party. Take your smoking experience to the next level with the Khalil Mamoon 22" Shareef hookah. INCREDIBLE SMOKING EXPERIENCE: More clouds, yet a smoother finish. 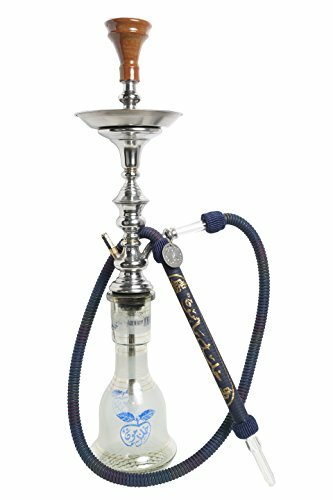 With its wide-gauge tubing, high-functioning purge valve, and bell-shaped base the 22" KM Shareef hookah offers the right balance of heat dispersion and smoke. BEAUTIFULLY CRAFTED DESIGN: This hookah is individually hand-crafted. From its silver-trimmed finish to its elegant stem and hose, the 22" KM Shareef hookah is bound to turn heads at any party. PROFESSIONAL STANDARDS: Stand out while getting the most from your smoking experience. Made in Egypt and shipped overseas, Khalil Mamoon hookahs have been considered the highest in quality for decades and are used by lounges all over the world. IN THE BOX: This hookah includes, the Silver Trimmed Base, Shareef Stem, Wood Tipped Hose, Standard Clay Bowl, Metal Tray, 3 Gasket Seals, Tongs, a Base Protector, and two Brushes for cleaning.